Rose suffered a broken nose, cuts and bruises. A Corby woman has appealed for the public’s help after her mum was injured in a hit-and-run incident. 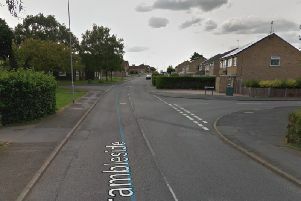 Rose Coupland, 55, was hit when she was getting out of a parked car in Willow Brook Road just after 10pm on Saturday, May 27. She suffered a broken nose, severe cut to the face and bruising - and now her daughter Terri has appealed for anyone who might have information to come forward. Terri said: “My mum was getting out of her brother-in-law’s car when a car come round the corner of Rockingham Road into Willow Brook Road at speed and went straight into her. “It made the car door crush into her, causing a severe cut to her face, broken nose and bruising and she fell to the floor. “Please if anyone knows anything come forward. Mrs Coupland lost a substantial amount of blood after being hit. Terri says she’s ‘angry and upset’ that someone could have just driven off, and added that the perpetrator would have had no idea of the severity of the injuries. She said: “My mum is doing okay but has a lot of mixed emotions, especially about going out in public due to her injuries. “I’m very angry and upset that someone could do this. “They could have killed her. A police spokesman said: “Officers would like to speak to anyone who may have witnessed this incident or have any information regarding it.